After the commercial failure of "Falling into Infinity", DREAM THEATER had to to pull off a major coup to keep their progressive metal crown. Furthermore, the band was lacking a genuine concept album to their discography to enter the prog hall of fame. Finally, fans were requesting a sequel to "Metropolis Part 1: The Miracle and The Sleeper", the most ambitious title from "Images and Words". All these goals will fully be reached with the sublime "Metropolis Part 2 - Scenes from a memory". This fifth studio opus also marks the arrival of keyboardist Jordan Rudess from LIQUID TENSION EXPERIMENT. Based on an instrumental demo recorded in 1996, the musicians extended the lyrics of "Metropolis Part 1" to narrate the story of a man though his anterior life, in two acts. Influenced by the greatest concept records of all time, such as RUSH's, ZAPPA's, YES', GENESIS' "The Lamb...", and especially QUEENSR?CHE's "Operation Mindcrime" and PINK FLOYD's "The Wall", "Metropolis Part 2" literally redefines modern progressive metal and simply stands as THE major concept album of the 90's. The quintet's musical elements such as multiple time signatures, raging riffs, breathtaking soli and typical gimmicks are of course present, however this time with more harmony, balance, richer instrumentation and better flow. Gorgeous! Act 1 is nearly perfect. The hypnotic countdown of "Regression" and its "The Wall-esque" acoustic guitar introduces "Overture 1928", an instrumental patchwork of the disc's main themes. The nightmarish and aggressive "Strange Deja Vu" is freaking good. Its rhythm changes are energetic and even a little groovy at times. The sad piano interlude "Through My Words" unveils another impressive composition, the powerful and beautiful "Fatal Tragedy". Its horrific atmosphere and multiple instruments create a tragic and thrilling sensation, carried away by magnificent soli. Wow! Great! Also featuring various musicians' interventions, "Beyond This Life" alternates raging darker, floating and funky sections. Unfortunately, the act finishes with the black sheep of the album, which is... a soapy ballad, "Through Her Eyes", the only weak track. Guess we cannot avoid this type of cheesy song in a DREAM THEATER release... At least, its "The Final Cut"-esque introduction is pretty charming. Act 2 starts with the longest and most progressive title of the record, "Home". Let's go straight to the point: this is simply one of the best prog Middle-Eastern-ish metal piece of its kind, bombastic and epic! This composition represents the style and quality of music you would expect by looking at the cover art of, say, you-know-who's "Powerslave". The theme from "Metroplis Part 1" makes a short incursion. The instrumental "The Dance Of Eternity" possesses a terrifying and haunting overture, as well as surprising moments, such as rag-time, while borrowing some parts from "Metroplis Part 1". We even got a bass solo from John Myung! Yes! After its beautiful piano opening, the enchanting "One Last Time" reuses the theme from "Strange Deja Vu", whereas "The Spirit Carries On" is quite "The Wall"-esque with its Roger Waters-ian whispered vocals and female choirs. "Finally Free" concludes the disc by alternating peaceful and tragic passages. Enjoyable but a bit too long. Anyway, this was a genuine mesmerizing journey, both nightmarish and dreamy. 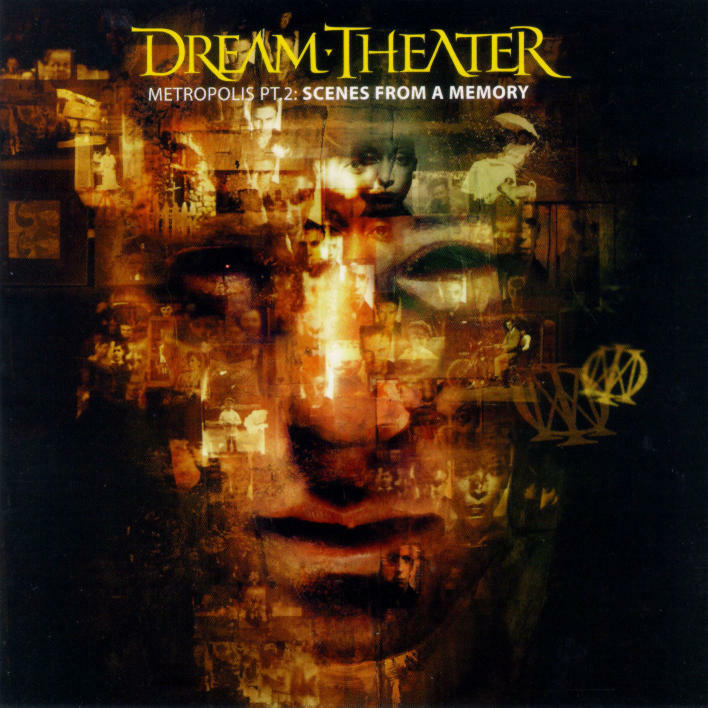 "Metropolis Part 2 - Scenes from a memory" is DREAM THEATER's magnum opus, transporting you into another - inner - world. Mindblowing, breathtaking, magic, epic, borrowing from numerous influences and various musical genres, this fifth studio album is simply a milestone in the prog metal genre. In the 90's, there are hardly no concept albums that could compete with such musicality, aggressiveness and virtuosity.